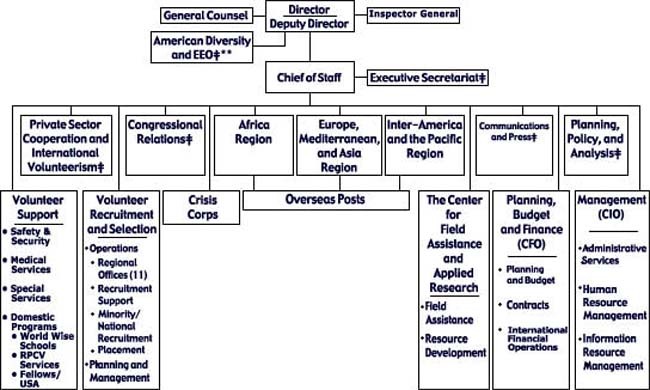 Following are biographies and information about Senior Staff who have been appointed at Peace Corps Headquarters with the new Administration. I am a volunteer, but I did'nt found how to be recruited for the good actions for Donguel-Sigon in Guinea. Excuse my bad english. Would you help me please? he is married to Catherine Hargrove and they hav a son known as Taylor.I humbly request your office if any help could be given so that i could contact him as soon as possible.My mobile number is 99249351 and a my home line is3363659.My mailin box number is Box 1091,Suva , Fiji islands. Hoping for a favourable reply.. I am looking for a gentlemen by the name Joesph Kelly or just Joe Kelly as we all used to know him. All I know is that he was from the USA and returned there around 1998/1999. I am trying to find out which omnibus I was in during my time in Ecuador 1990-1992. My name is Lawrence Jay Cevelo Jr. and you may contact me at jaysweep@yahoo.com. My name is Jean-Jules Fogang. I am now living in the US with my family since December 2004. I would like to get in touch with Jerry Douglas Brown, a peace corps member, who was my English teacher back in Cameroon in !976. I was his best English student during the school year 1976-1977. I AM LOOKING FOR GENTLEMEN CALLED JAMES WILLIAM PANE WHO WAS STATIONED IN SEQAQA, MACUATA, FIJI. HE WORKED IN THE AGRICULTURE DEVELOPMENT KNOWN IN FIJI AS NLDC. I WOULD LIKE TO GET IN TOUCH WITH HIM. MY EMAIL ADDRESS IS echo777er@hotmail.com. I was a volunteer in the Peace Corps in 1979 - 1982, serving in Senegal. Now I am 60, not working, and I would like to know if the Peace Corps could use me, take me. I am interested only in going to Thailand. I am looking for a gentle man called John Randy Scott. He was the American Peacorps who came to Thailand in 1972-1974, I am not quite sure. He was my English teacher in Nareenukul School, Ubonratchathani, the North-Eastern part ofThailand. At that time he named me "Candy". I would like to get in touch with him. My email address is judjing@hotmail.com. We here by humbly ask you to send us at least two volunteers, gender balanced, to assist us directly benefit from the support pragrams you offer for Africa. We are community of students, lecturers and civil society members within and around the National Teachers' College and Gulu University, in Northern Uganda. We promote human rights in relation to gender equality, poverty alleviation, health, agriculture, education, employment and information access. We are in need of your humanitarian missions such as those that you offer, especially the presentations to motivate youthful communities to create healthier and stronger abilities of good leadership national and international levels. We ask that you link us with volunteers that will diligently inspire youthful communities to chose to live lives of compassion towards others while embracing lifestyles that care about people with simplicity, kindness and mercifulness. Would you link us to your Embassy and voluntary organizations in Uganda. Thank you so much.